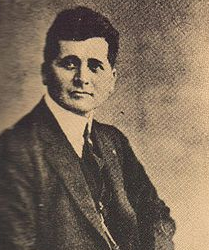 Felipe Carrillo Puerto (November 8, 1872 – January 3, 1924) was a Governor of the Mexican state of Yucatán. He was born in the town of Motul, Yucatán, and was of partly indigenous Mayan background; he was rumored to be a descendant of the Nachi Cocom dynasty of Mayapan. He was a socialist who favored land reform, women's suffrage, and rights for the indigenous Mayan people. He had a romance with a United States journalist, Alma Reed of San Francisco, California, which was commemorated in the song "Peregrina". Carrillo Puerto died by assassination in January 1924.Felipe Carrillo Puerto was called the Red Dragon with the Eyes of Jade by his enemies and the Apostle of the Indians by those who loved him. He was one of 14 children, 13 of whom lived to adulthood. All but one of the Carrillo Puerto siblings worked to better the lives of the Mayan people. When Felipe was killed, three of his brothers, Wilfrido, Benjamin, and Edesio, were killed with him, as well as eight of their friends. marriage. The ballad "Peregrina" is based on their romance. 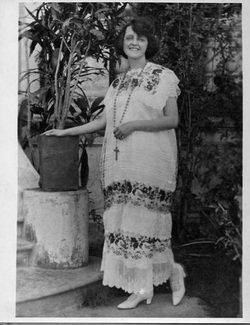 Reed remained interested in Mexico and in Carrillo Puerto's causes; she was eventually awarded Mexico's Aztec Eagle award for her work on behalf of Mexico's culture and arts.Later in life, Reed was a supporter of the artist Jose Clemente Orozco and wrote a biography of him. 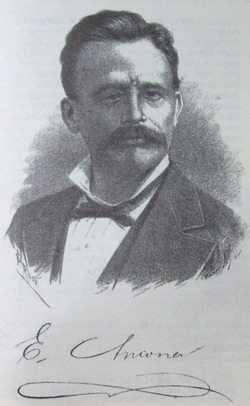 Eligio Ancona del Castillo (born November 30, 1835 in Mérida, Yucatán – died April 3, 1893 in Mexico City) was a Mexican lawyer and liberal. He served as governor of the state of Yucatán from 1868 to 1875. He was also an author and novelist; author of a notable compendium of the history of Yucatán. His remains were interred at the Panteón de Dolores in Mexico City, in the Rotunda of Illustrious Persons on April 13, 1903.